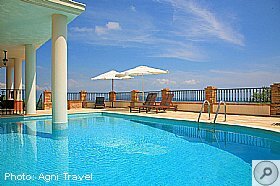 Planning a Holiday to Corfu? 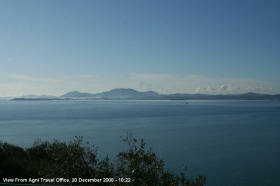 Corfu Port: Corfu's port is at the edge of Corfu (Kerkyra) town. Ferries from Greek mainland (Igumenitsa and Patra) offer a regular service as well as ferries from Italy (Venice, Ancona and Brindisi). Corfu port is also a popular stop for visiting cruise ships. 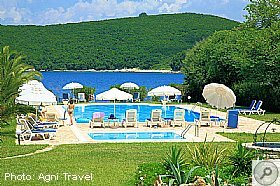 Driving to Corfu: Some drive to Corfu, the regular ferries from Italy and the Greek mainland to Corfu make the trip easier to plan. The roads of Corfu are generally in good condition, even if unavoidably steep and twisting in some locations. 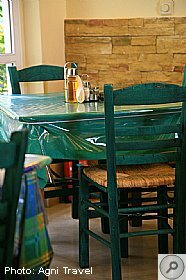 This website, the Corfu Travel Guide, is brought to you by the Taverna Agni. 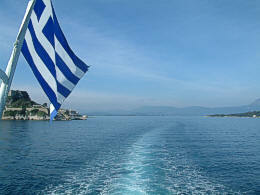 The guide has taken over 10 years to complete and is a result of our experiences here on Corfu. 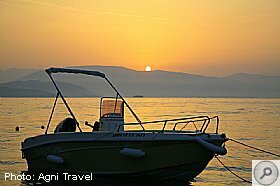 We hope you enjoy our website and above all find it useful in helping you make the most and enjoy your holidays to Corfu. The Taverna Agni Team. 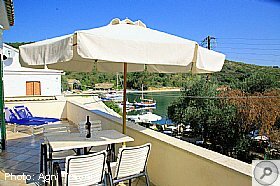 What type of Accommodation is on Corfu? No vaccinations are required for visiting Corfu or Greece. 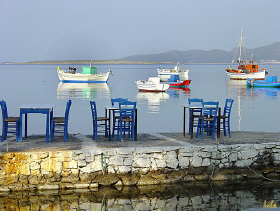 There is no risk of malaria in Greece or any other tropical diseases. What are those black nets for under the trees? 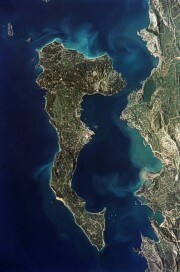 What island is that opposite Corfu? 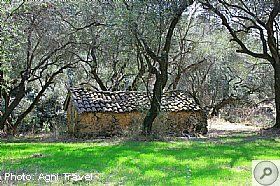 Corfu has seen a colourful past where Greek, Roman, Venetian and French occupations have left their marks, including two forts. 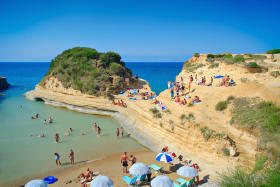 Many myths and legends feature Corfu including: Hercules, Homer, Odysseus and Jason with his Argonauts. 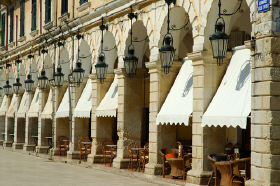 Not surprisingly, Corfu Town is on the UNESCO World Heritage List and this has helped to protect and preserve the architecture and monuments on Corfu. 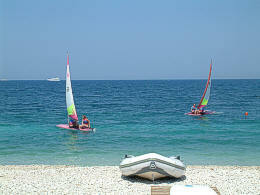 Corfu's tourist season is from early May until the end of October. The hottest (and driest) months being July and August where the temperature will often reach 35c. 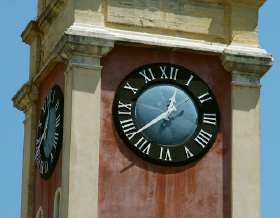 Some tourists do visit Corfu during the winter months and although mild, it can often be wet. 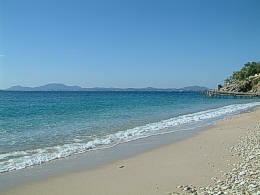 Our detailed Corfu Weather Guide can help you choose when to visit. 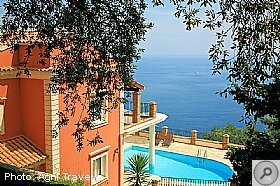 Meon Villas, James Villas, Simply Travel, Villa Plus, Vintage Travel: offer Villas with Pools on Corfu. 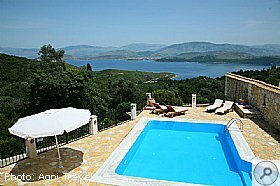 Why rent a villa on Corfu? Recent Newspaper and television news stories have recently focused on Corfu concerning the "Agni-Gate" scandle between Mr George Osborne and Mr Mandelson. Why do Mr Osborne and Mr Mandelson holiday on Corfu and more specifically within the Agni region? 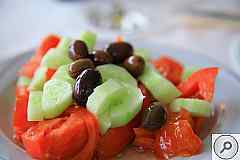 Those that regularly visit Corfu will already know! 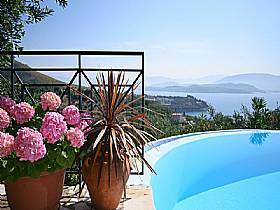 Unspoilt Locations Due to strict planning regulations, Corfu does not have any building higher than two levels. (Some hotels were permitted to be built during the 1970s, but thankfully only a few.) 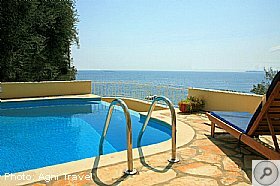 This has prevented traditional hotels (and the mass tourism that often accompanies them) from damaging the Corfu coastline. "Corfu town is Venice and Naples, a touch of France and more than a dash of England, apart of course from being Greek" - Countess Flamburiari. 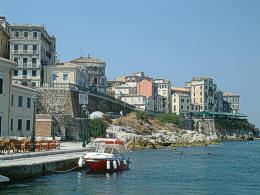 Kerkyra or Corfu Town, is the capital of Corfu. The town is a historic maze of narrow streets dominated by the 16th century fortress. Around every corner can you can find a chapel, old mansion or secret garden square. The café at the Liston: built by the French in the same style as those in Rue de Rivoli, Paris; is probably the place to 'people watch' while enjoying a Ginger beer. 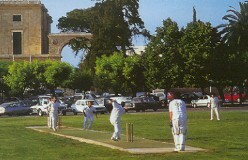 (The British also left Cricket, which was played on the pitch opposite the Liston. Sadly today, due to nearby parked cars, they no long play in this famous location.) The narrow streets radiating off from the Liston, house small shops of every commercial nature. Dominated by the 'gold shops'. Corfiot craftsmen excel at designing and making Greek jewelry in gold - this coupled with competitive prices may tempt you. Among the bustle, look out for those shops and stalls selling local items like wild honey, fig cakes and handmade lace. The most famous church on Corfu, and the most visited, is Saint Spiridon's Church, home to the island's patron 'mummified' saint, is just behind the Liston. The church is impressive and worth visiting, but please ensure you are suitably dressed before visited this holy site.